Should policymakers – politicians and high-level state officials – be experts in their fields? Does professional competence effect public policies at all? And does it prove itself? These, undoubtedly, important issues to be discussed and researched. But in order to delve into them, first one needs to understand why and when some governments appoint people with professional economic background and headed by economists, while in orther cases the picture is different? In “The Technical Competence of Economic Policy-Makers in Developed Democracies” Mark Hallerberg and Joachim Wehner tackled these questions. They analyzed educational and occupational background data for 1200 policy-makers (presidents/prime ministers, finance ministers, and central bankers) from EU and OECD democracies since 1973. The findings are not just interesting, they also could explain a lot about economic policymaking. – Eurozone leaders are unlikely to have an economics education. – New democracies and presidential systems select more technically competent finance ministers. – The longer a government is in office, the less technically competent are finance ministers appointed, with the reverse pattern for central bank governors. 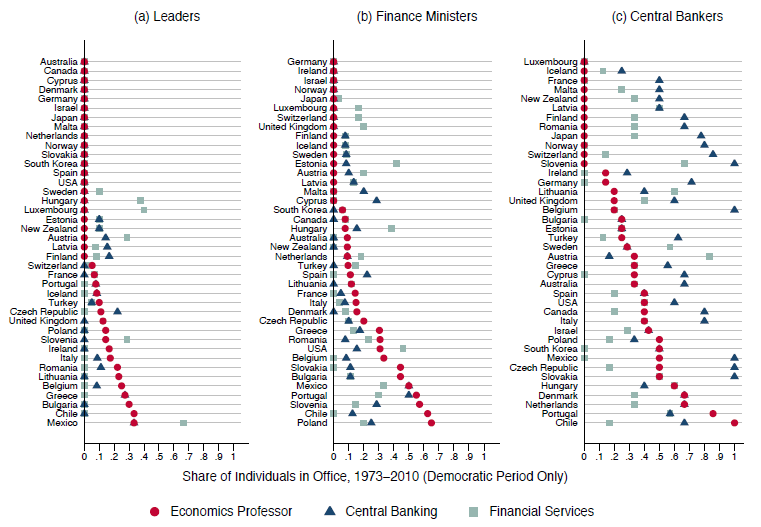 – Left leaders appoint central bankers with more economics training than right ones, while finance ministers from right parties are more likely to have a financial industry background and less economics training. – Governments appoint more technically competent economic policymakers during financial crises. The appointment of an economics PhD as a central bank president is 22 per cent more likely during a banking crisis. Taking into account the period covered Hallerberg and Wehner in this research, its findings may imply many conclusions regarding the conquest of neoliberalism… One of them might be that while the dominance of economists is still a matter of fact, even when it is not a matter of numbers, we must not be misled that Neoliberalism is economists’ project. Neoliberalism is a political project in which economics trained politicians and bureaucrats play an important role to maneuver the state, rather than weaken it, to sail in a different direction, that is to allocate state resources differently. This entry was posted in Papers and tagged central banking, crisis, economics, European Union, knowledge, neoliberalism, OECD, policy, politics, professionals. Bookmark the permalink. 1 Response to Why and when do governments appoint economists and economics-trained politicians?